Product prices and availability are accurate as of 2019-04-24 10:35:38 UTC and are subject to change. Any price and availability information displayed on http://www.amazon.com/ at the time of purchase will apply to the purchase of this product. 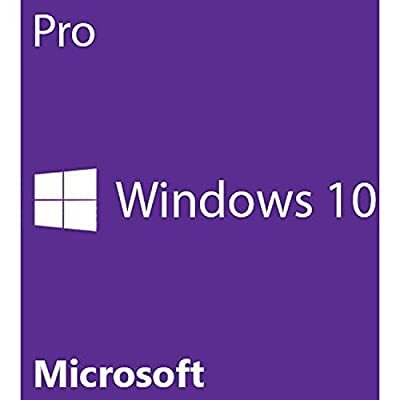 Windows Pro 10 64Bit English 1pack DSP DVD. Windows 10 is so familiar and easy to use, you'll feel like an expert. The Start Menu is back in an expanded form, plus we'll bring over your pinned apps and favorites so they're ready and waiting for you. It starts up and resumes fast, has more built-in security to help keep you safe, and is designed to work with software and hardware you already have. Windows 10 comes with Microsoft Edge, an all-new browser that's built to give you a better web experience. Write2 or type notes directly on webpages and share them with others, read online articles free of distraction, and save your favorite reads for later access. And with Cortana3 enabled, you get instant access to key actions-like making reservations or reading reviews-without leaving the page you're on. Easily snap up to four apps in place and see all open tasks in a single view. You can even create virtual desktops when you need more space or want to group things by project. Windows 10 enables your apps to look and work great in all modes, on all devices. On 2-in-1 devices, your screen can be optimized to work with touch or keyboard and mouse. OEM system builder windows 10 Professional 64 bit version. Full version, not an upgrade. Includes a DVD, certificate of authenticity and a key code. Supports refurbished, new and used PCs and laptops. Genuine DVD with holograms in inner and outer ring of DVD.